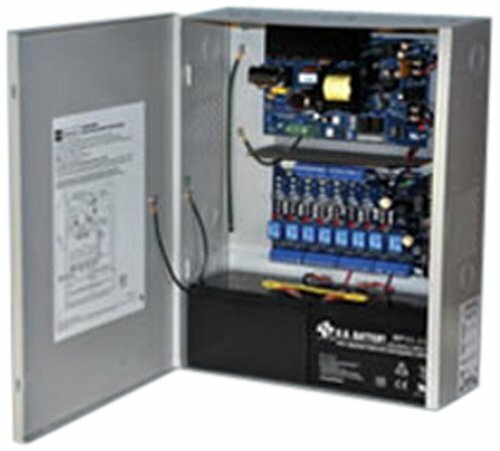 Altronix 8 PTC outputs power supply/access power controller converts a 115V AC 60Hz input into 8 independently controlled 12V DC or 24V DC Fail-Safe and/or Fail-Secure outputs with a total of 6 amp continuous supply current. Outputs are activated by an open collector sink or normally open (NO) dry trigger input from an access control system, card reader, keypad, push button, PIR, etc. This unit will route power to a variety of access control hardware devices including mag locks, electric strikes, magnetic door holders, etc. The outputs will operate in both Fail-Safe and/or Fail-Secure modes. This unit is designed to be powered by one common power source (factory installed) which will provide power for both the board operation and locking devices, or 2 totally independent power sources, 1 providing power for board operation and the other for lock/accessory power. The FACP Interface enables emergency egress, alarm monitoring, or may be used to trigger other auxiliary devices. The fire alarm disconnect feature is individually selectable for any or all of the 8 outputs. Input: Input 115V AC 60Hz rated at 3.5 amp. Output: 12V DC or 24V DC at 6 amp supply current. Class 2 Rated power limited outputs. Output ratings: PTCs are rated at 2.5 amp. Filtered and electronically regulated outputs (built-in power supply). Fire alarm disconnect input options: Normally open (NO) or normally closed (NC) dry contact input. Polarity reversal input from FACP signaling circuit. Built-in charger for sealed lead acid or gel type batteries. Zero voltage drop when unit switches over to battery backup (AC failure condition). ACM8CB board main fuse is rated at 10 amp. Wall mount enclosure for indoor use. Accommodates up to 2 12V DC/12AH batteries. Measures 12-1/4-inches width by 15-1/2-inches height by 4-1/2-inches depth. 1.125-inches and 1.375-inches combination knockouts. UL listed, CSFM - California State Fire Marshal Approved, MEA - NYC Department of Buildings Approved.